After you start your automation, you'll be able to make changes to the workflow and the emails it contains. When editing the overall automation, you can pause or resume all of your emails, change your workflow settings, reorder the sequence of content, and add new emails. In this article, you'll learn how to find and edit an active workflow. To learn how to edit triggers, schedules, segments, actions, or content, check out Edit Automation Emails. To learn how to change who receives your automation, read Manage Subscribers in an Automation. Date-based automations allow subscribers to move in and out of queues, depending on their eligibility and your delivery settings. If the overall automation or an individual email is paused on the date a subscriber is scheduled to receive an email, the subscriber misses that email and moves into the next email queue in the automation. After an automation is active, you can no longer make changes to the workflow type or list. However, you can pause emails in an automation, individually or all at once, to make other changes. To pause all emails in an automation, follow these steps. Now that your overall automation is paused, you can make changes to any of its emails. Remember that paused automations continue to build a queue, and will send to the queue when restarted. After your automation is active, you can’t change the list. However, you can make a copy of an automation and send it to a new list. To change the list in an automation, follow these steps. Pause all emails in the automation you want to work with. Click the drop-down menu next to the automation you want to work with and choose Replicate. 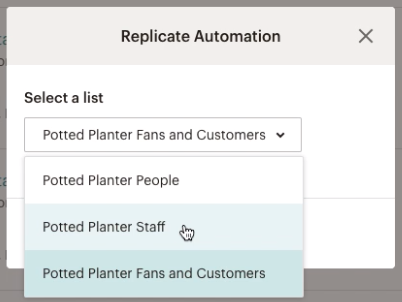 Select a new list in the Replicate Automation pop-up modal. Now that you have selected a different list, you can make additional changes to the automation before you start sending. You may want to resume or archive the original automation. In your automation settings, you can rename your automation, change your From name or From email address, choose different tracking options, and more. To edit most types of automation in Mailchimp, follow these steps. Click the drop-down menu for the automation you want to work with, and choose Edit. Edit your Workflow name, From name, or From email address as needed. You can also change the tracking options and other settings. Navigate to the Confirm step and click Resume Workflow. You can swap the content of any emails in a draft or paused state, which allows you to reorder your automation. Triggers, scheduling, segmentation settings, queues, and post-send actions will remain the same. To reorder emails in a automation, follow these steps. Click and drag the three dots icon next to the draft or paused email you want to work with, and drag the content to its new position. It's important to note that the email you want to swap content with must also be in a draft or paused state. After you start an automation, you can continue to add new emails. For list activity automations, subscribers who have already met or exceeded the set delay will be held in a queue and sent the new email immediately after you resume the automation. If you don't want queued subscribers to receive the new email, use segmentation to filter them out. To add an email to an active automation, follow these steps. Continue through the Email Designer to create your automated email. When you're done, return to your automation timeline and click Start Email. Repeat this process to include up to 100 emails in your automation. When you archive an automation, you permanently end the automation and keep its report data. 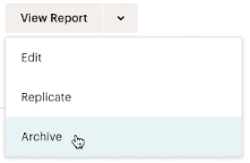 This is a great option when an automation has run its course and you want to maintain the campaign report, or save the workflow to replicate later. After you archive an automation, you cannot restart it. If you want to resume your automation later, pause it instead. To archive an automation, follow these steps. 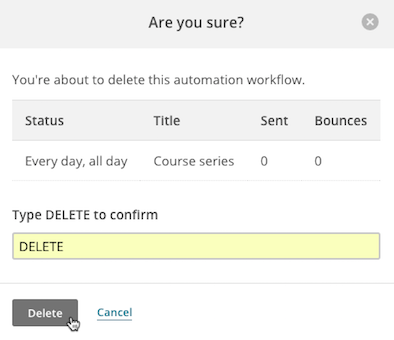 Click the drop-down menu for the automation you want to work with, and choose Archive. In the Are you sure? pop-up modal, type ARCHIVE, and click Archive. You can find your archived automations in the Archived folder on the Campaigns page. We’ll create the folder the first time you archive an automation. 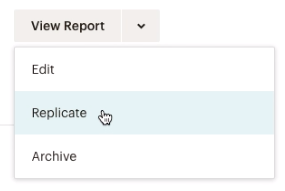 When you delete an automation, you also delete its report data. Automation reports give insights into how automations perform, and can help you understand how to improve subscriber engagement. To save this information, archive your automation instead, or export your report before you delete anything from your account. To delete an automation, follow these steps. Pause all emails in the automation you want to delete. Save and exit to the Campaigns page. Check the box for the automation you want to delete. In the Are you sure? pop-up modal, type DELETE, and click Delete. After you start an automation, you can continue to edit its emails. Learn how to edit the triggers, schedules, and content of automation emails. View subscribers in an automation queue, change recipients, and let subscribers join or leave an automation.